George Gatto Jr. is business development manager for Gatto Industrial Platers, LLC, Chicago, IL; tel. 773-287-0100, www.gattoplaters.com. The processes of electroplating metal products and of coating those products with paints and powder coatings—both essentially the application of a new surface to a part—are basically similar, particularly in their shared emphasis on careful surface preparation. But the significant differences between the processes, until fully understood, can negatively affect the successful coating of formed and stamped metal products that have been plated. Trapped plating chemicals inside of porous parts can be released during the curing process, causing pinholes and bubbles in powder coating. As a provider of zinc plating, zinc-nickel plating and aluminum chromate, we’ve plated virtually every type of formed metal product and assembly, many of which have then been powder coated or painted. One of our primary objectives, as we work with metalforming companies and their coaters, is to educate them in detail about the specifics of plating as they affect the application of various coatings. Following are two of the most common and important areas where the interaction between plating and coating can result in significant challenges, and the ways that platers and coaters can work together to alleviate them. Coaters of metalformed products know that the success of their processes, whether involving chemical substances such as paint and other coatings or powder coatings, depends to a great degree on the condition of the surface to be coated. Resulting problems, from poor adhesion to surfaces marred by pinholes, trapped bubbles and other defects, can quickly destroy the value of a coating and reflect negatively on the brand image of a coater. Consequently, coaters spend considerable time and effort on cleaning surfaces thoroughly prior to coating. Both paint and powder coaters, for example, sometimes experience adhesion issues when coating over electroplated products. As a result, even after thoroughly cleaning parts with a phosphate solution they sometimes resort to sanding the surfaces of parts to be coated by hand to provide good powder adhesion. The part on the left has been zinc-plated, with a chromate applied over the plating. Thin-film chromate is recommended for parts to be painted after plating, as the film reduces the chance of adhesion issues or bubbles in the paint. The part on the right has been zinc-plated then coated with a thick-film chromate, which is intended to provide better corrosion resistance on nonpainted parts. However, the powder-coating process will destroy this chromate, likely causing adhesion issues and bubbles or pinholes. As part of the normal plating process, another chromate layer is added to a part after it is plated to control corrosion of the plated surface, a fact that coaters should be aware of, as this chromate finish often is the source of the adhesion problems they face. The finish on the plated part can be partially destroyed by a negative chemical reaction between the chromate and the phosphate cleaning process used by most powder-coating and paint finishers. As a result, the powder coating, paint or other coating then is being applied over a “loose” surface of partially removed chromate that can lead to adhesion failure. That, in turn, leads to either a scrapped part or to customer dissatisfaction. Gatto Industrial Platers gives metal-part coaters three recommendations to meet this challenge. 1) Ask the platers you work with to skip the chromate step in the plating process. Powder coating directly over zinc plating actually produces the optimum adhesion result. However, the chromate finish protects the plated part from oxidizing during the period between plating and powder coating. 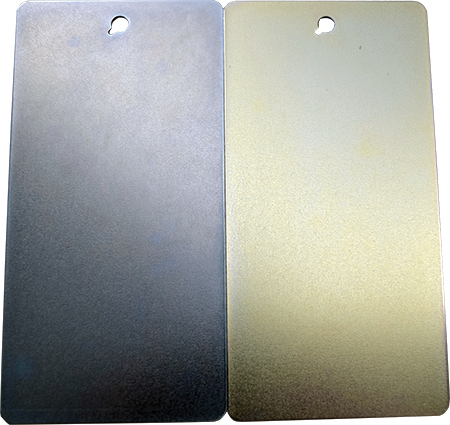 The plater has a couple of options to control oxidation, such as using a bright dip after plating or applying a rust inhibitor. 2) When working with chromate-finished parts, ensure that the chromate has fully cured after plating before applying any type of coating. Full curing usually requires 24 hr., and any powder coating or painting performed during the curing period will bring problems. 3) Replace the typically used phosphate cleaning process with a simple rinse. Parts are relatively clean after plating, and this change avoids the phosphate/chromate reaction and leads to better coating adhesion. A metal surface has many microscopic pores that can trap plating chemicals. Later, when powder coaters cure their powder applications—usually at temperatures of approximately 350 F—these residual chemicals turn to gases and release through the surface of the powder, creating pinholes or bubbles in the coated surface that make the finished product unacceptable. Our experience shows two effective solutions to this problem, one to be addressed by a change in the usual plating process, and the other by a change in the usual powder-coating procedure. 1) Following plating, platers should eliminate the normal chromate-application step, which can contribute to chemicals remaining trapped, and then bake the finished parts for 1 hr. to release any chemicals. 2) Powder coaters, after they have applied the powder, should extend the time of their normal curing process and allow their ovens to slowly ramp up to curing temperature. This will allow the top layer of powder to remain soft for a longer time, enabling gases to release through the coating before it hardens, and avoiding pinholes and bubbles in the finished surface. Open communication is vital among platers, coaters and metalformers. Greater knowledge about each other’s processes always leads to better results, reduction of failures and improved customer satisfaction. Metalformers, platers and coaters should view each other as partners and keep each other informed about how our processes work. For example, Gatto gives metalformers and coaters a full tour of its 210,000-sq.-ft. facility and a thorough explanation of each of the plating processes. Our specialists describe in detail how products are handled during the plating process, what finishes are used in plating and what can motivate a change from one particular finish to another.